Computers are used more extensively on the Space Transportation System (STS) than on any previous aircraft or spacecraft. In conventional aircraft, mechanical linkages and cables connect pilot controls, such as the rudder pedals and stick, to hydraulic actuators at the control surfaces. However, the Shuttle contains a fully digital fly-by-wire avionics system. All connections are electrical and are routed through computers. To give the spacecraft more autonomy, system management functions (fuel levels, life support, etc. ), handled on the ground during previous flight programs, are monitored on board. Software can be adjusted to suit increasingly complex and varied payloads. Subsystems, like the main engines, that had no computer assistance before use them for performance improvement. And, as in Gemini and Apollo, guidance and navigation tasks are accomplished on the Shuttle with computers. All these functions, especially flight control, are critical to mission success; therefore, the computers performing the tasks must be made fail-safe by using redundancy. Meeting these requirements has resulted in one of the most complex software systems ever produced and a computer network within the spacecraft with more powerful hardware than many ground-based computer centers in the mid-1960s. The major differences between the Shuttle computer system and the systems used on Gemini and Apollo were the choice of an "off-the-shelf" main computer instead of a custom-made machine and the pervasiveness of the system within the spacecraft, since the main computers are the heart of any true avionics system. Avionics (aviation plus electronics) grew in the 1950s and 1960s as electronic devices, especially digital devices, replaced mechanical or analog equipment in aircraft. These digital devices were combined into a coherent system, rather than isolated in function and location within the aircraft. Several modem military airplanes have applied this concept to varying degrees. The FB-111, an Air Force tactical bomber, has a complex avionics system that Rockwell International built just before it was awarded the Shuttle contract1; the F-15 fighter used an AP-1 computer in its system. A repackaged version of the F-15's computer became the AP-101 used in the shuttle2. However, in no aircraft has the Shuttle's avionics system been matched as yet. For instance, its main computers have to interconnect with other computers in subsystems, such as the controllers on each main engine, whereas most aircraft systems are centered on a single set of machines. Since the Shuttle is completely dependent on the success of its avionics system, each component must be made failure proof. The method chosen to ensure this is absolute redundancy, often to a depth of four duplicate devices. Managing this level of redundancy became a large problem in itself. .....software is directed at easing the necessary commanding of the computers. 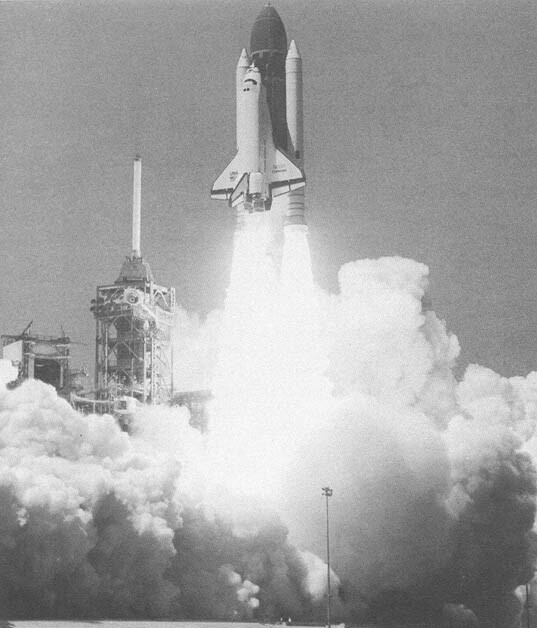 In general, software development for the Shuttle has far outstripped any previous NASA ground or flight system in effort and cost. The combination of requirements forced the Agency to pioneer techniques in digital avionics, redundancy management, computer interconnection, and real-time software development.